If anyone watched Rocky and Bullwinkle Show from the 60's will remember the little segments of Peabody's Improbable History. The genius beagle and his adopted son use a time machine which gave viewers a comedic view of important events of the past. Jay Ward's characters are re-imagined in a script by Craig Wright and directed by Lion King's Rob Minkoff. It is the first animated feature from the recent acquisition of Classic Media by DreamWorks. It is of course in 3D. Mr. Peabody (voiced by Ty Burrel) was a puppy that no one wanted because he was a bit of nerd and not a playful dog that kids expected. So he spent his life in pursuit of knowledge and becoming the smartest being in the world. Besides being a talking dog, he's a business titan, inventor, scientist, Nobel laureate, gourmet chef and two time Olympic champion. He finds an abandoned child and petitions to become his parent. Because if a boy can have a dog, why can't a dog have a boy? Sherman (Max Charles) is bi-speckled youngster who is starting school and branching out as an individual, which to causes Mr. Peabody some trepidation. Sherman is an enthusiastic student and challenges his classmate Penny (Ariel Winter) when she says that George Washington cut down a cherry tree. Sherman knows that's not true, because he heard it from Washington himself when he and Mr. Peabody travelled back in time using Peabody's invention the WABAC machine. Of course he can't prove it without getting his adopted parent in trouble, so Penny ends up bullying him and calling him a dog. Sherman and Penny end up in an altercation that has Mrs. Grunion (Allison Janney) threating to have Sherman removed from his home because a dog is not a proper parent for a human child. Mr. Peabody tries to make an impression on Penny's parents (Leslie Mann and Stephen Colbert) so the issue will be settled before Mrs Grunion shows up. Meanwhile Penny finds out about the WABAC machine and talks Sherman into using it which starts a series of historical misadventures where they visit ancient Egypt, the Renaissance, ancient Greece and ending up messing with the space/time continuum that threatens to destroy the world. The cast includes some familiar actors like Stanley Tucci as Leonardo da Vinci, Lake Bell as Mona Lisa, Patrick Warburton as King Agamemnon, Mel Brooks as Sigmund Freud and Dennis Haysbert as the Judge. 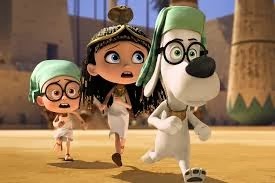 The dialogue is filled with Mr. Peabody's awful puns which the adults will groan and enjoy, but the kids will be like Sherman saying “I don't get it.”. The animation is clear crisp and full of color feast for the eyes. And there's a lesson of course to be learned that it doesn't matter if your parents are not the normal kind doesn't mean it's a bad thing as long as there is love, consideration and protection for the child. Even if he's just a dog.